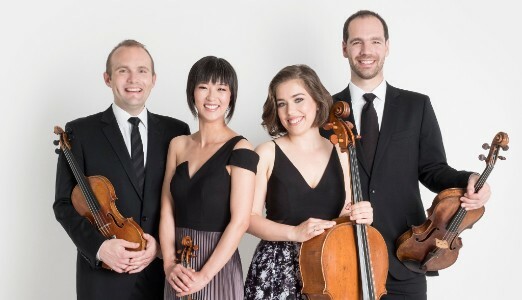 Since their formation at Oberlin Conservatory twelve years ago, the Jasper String Quartet has been wowing audiences and their fellow musicians across the country, playing music from a host of time periods and genres, from the classics to contemporary debuts. They are recipients of the Cleveland Quartet Award, bestowed only once every two years, and the Fischoff National Chamber Music Association’s 2016 Educator Award, recognizing their admirable work with young musicians. Last year, they were a Featured Guest Artist at Swarthmore College, playing with the Lab Orchestra, giving master classes and leading sectionals. Many were disappointed when the quartet’s solo concert was postponed last year due to inclement weather – particularly those in the orchestra who had closely worked with the group – but this week, the Jasper String Quartet is returning to Swarthmore. While professional musicians in any context can inspire emotion and excitement in their playing, there’s something special about not only listening to but watching a world class chamber ensemble in their element. The soloistic virtuosity and nuance, along with the rich sonorous strings and engaging stage presence of the Jasper String Quartet make their performance truly a sight and sound to behold. The Jasper String Quartet will be performing on October 27, at 8:00 PM in Lang Concert Hall. Their repertoire will feature the Haydn Quartet op. 64 No. 6 and Smetana Quartet No. 1 “From my Life,” along with Joan Tower’s “Wild Summer” and Caroline Shaw’s “Valencia”. This entry was posted in Music on October 26, 2018 by dpulley1.